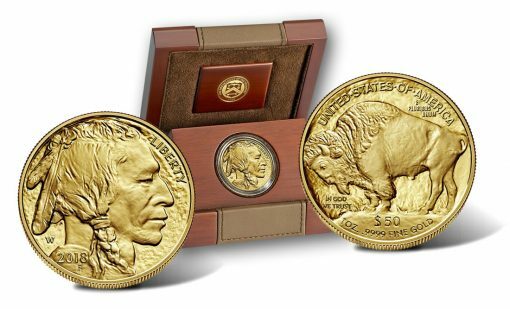 Today, May 10, the United States Mint started selling the 2018-W $50 Proof American Buffalo Gold Coin. The 2018-W $50 Proof American Buffalo Gold Coin ships in a hardwood box with a matte finish and a leather-like inset. It is accompanied by a Certificate of Authenticity. Each piece is struck from 1 ounce of 24-karat, 99.99% pure gold at the U.S. Mint’s facility in West Point. Initial pricing is $1,710.00 with the amount subject to change weekly based on the Mint’s pricing matrix which ties precious metal coins to market conditions. Adorning the gold coin are two classic designs that first appeared on U.S. coinage in 1913. They match the imagery found on companion bullion coins also produced by the United States Mint. However, unlike those, each is in a collector-grade proof quality finish. Coin obverses (heads side) offer a representation of a Native American. The right facing portrait first appeared on 1913-dated nickels as designed by artist James Earle Fraser. Inscribed to the right of the portrait is "LIBERTY" with "2018" on the shoulder of the individual. An "F" is below the year acknowledging the artist. Behind the neck of the Native American we find the mintmark of "W" indicating its production at the West Point Mint. Serving as the reason for the its name, coin reverses (tails side) offer an American Buffalo (bison) that Fraser also designed for nickels that circulated from 1913 to 1938. Reverse inscriptions read "UNITED STATES OF AMERICA," "E PLURIBUS UNUM," "IN GOD WE TRUST," "$50," "1 OZ.," and ".9999 FINE GOLD." Coin specifications include a diameter of 1.287 inches (32.70 mm), a weight of 31.103 grams, and a reeded edge. 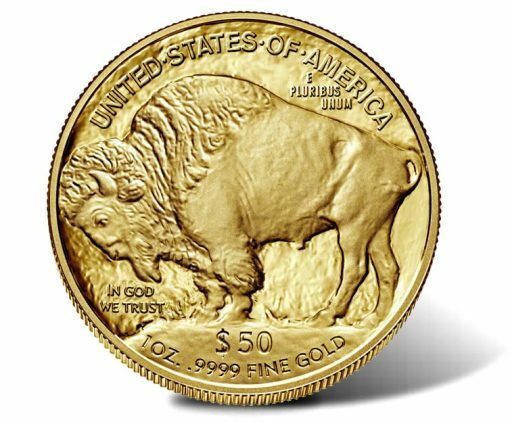 In addition to the 1-ounce proof and bullion coins, the U.S. Mint over the years has issued other variations of the American Gold Buffalo to include fractional editions and a special reverse proof to celebrate the 100th anniversary of the James Earle Fraser designs. 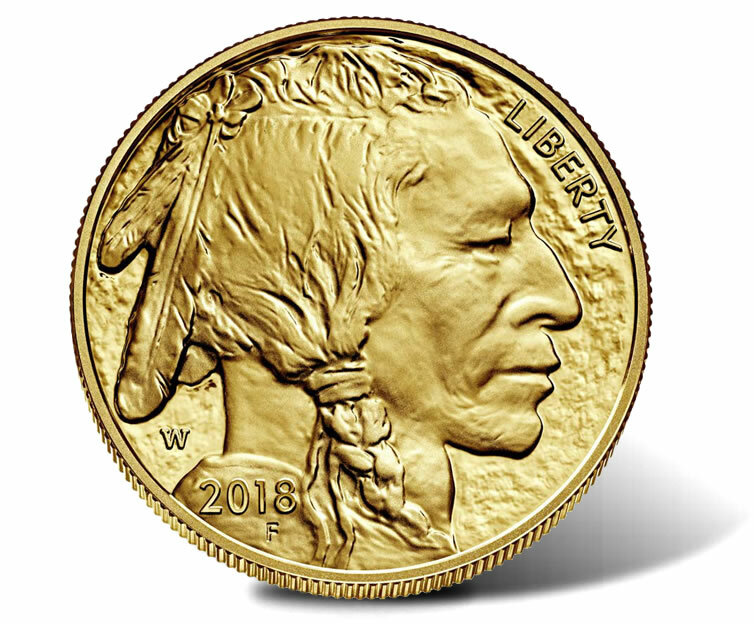 The 2018-W $50 Proof American Buffalo Gold Coin is available directly from the U.S. Mint via its webpage dedicated to gold coins, located here. Phone orders are also accepted by calling 1-800-USA-MINT (872-6468). No mintage, product or household order limits apply. If *i remember correctly, late in 2006, i picked up the 06*w,proof under $675., & the 2007 bullion version gold *Indian head, just over $700. Crickets……..the silence of the base…….HELLO US MINT!